Spectacular ocean and beach views from this unique Langs Cove beach house. You can see the amazing views from the lounge, patio and two of the bedrooms - with separate entrances for your convenience! And the beach is only a short stroll away! Nico's Beach House is a desirable Langs Cove holiday home for anyone from couples on a romantic getaway, to the extended family! This listing is for the middle level and the studio. The middle level features 2 Bedrooms, Bathroom (with bath), and an additional open plan kitchen/dining/lounge for your convenience, and a large outdoor patio. This level sleeps 5-6 people on 1 King bed, 1 Queen bed and 1 Sofa bed in lounge. The bottom level studio includes a kitchenette, ensuite bathroom with shower and can sleep 2-3 people, in 2 King Single and 1 Single trundle beds. (The property has a top level apartment similar to the middle level in layout, please see our other listing on this site - for details. There is Sky Television (Sport) and Wireless Broadband Internet available across all levels at this amazing holiday accommodation. There is a Gas Barbecues on the outdoor patio area plus garaging for 3 cars. Cleaning fee can be waived by owners on prior agreement. Enjoyed the house with plenty room to spread out . Outdoors could do with a bit of a tidy but inside very comfortable . Kitchen cupboards could do with a bit of organising as with the two kitchens things had been moved around . We enjoyed our stay and Rodger was was good to deal with and amendable . 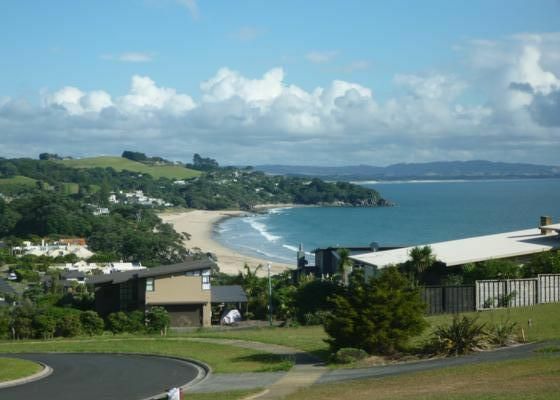 We just love its location, walking distance to the beach & beautiful sea views. Our second Christmas holidays here & we love it. Property was gorgeous! Everything was perfect and we had an amazing time! Loved the property, location , setup , out look and fantastic owners to deal with. Loved the property, location , setup , out look and fantastic owners to deal with. Forgot to write in guest book , probably due to reluctance to leave. Had a fabulous holiday and would love to come back again. Great property - all exactly as represented in the listing. Great property - all exactly as represented in the listing. Well set up and very family friendly. Added bonus of pleasant welcoming neighbours! Would book again if we decided to revisit the area.